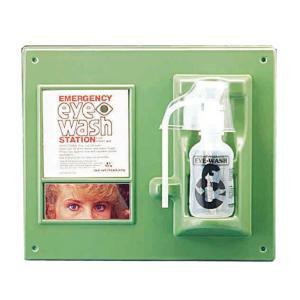 Laboratory Eyewash Station that is hard to miss in any lab. Kept filled with sterile solution, it is ready to provide immediate emergency relief. To use, flip the cup lid open, hold against the injured eye and apply pressure to bottle. The plastic unit also has four screw holes for wall mounting, a mirror, instructions, and a dust cover. Total size 17.5 x 15". Does not meet hand free ANSI requirements.